Since publishing my last Ten Things of Thankful post, I have driven to and from California (thus switching time zones) and turned my clock ahead. As a result, my body still doesn't know what time it really is. The calendar, however, tells me it is time to write about those things for which I am thankful. 1. I'm thankful that John and I ran the Rex Lee 10 K together. The sun shone, the temperature was perfect for running--a bit on the chilly side, but not freezing--and the course wasn't too brutal. I was on the recovery side of a cold, so I didn't do as well as I would have liked, but crossing the finish line felt good. 2. I'm thankful for an uneventful drive to California. Because I left after the race, I decided to split the drive into two days. I stopped in St. George for the evening. 3. I'm thankful for the Meetinghouse Locator function of the lds.org website (found in the "Tools and Support" section of the drop-down menu under "My Account and Ward"). I wanted to go to a church service Sunday morning, but also wanted to make sure I went to an early service (to avoid hitting the inevitable Sunday night traffic caused by Californians returning from their weekend trips to Las Vegas.) I found a congregation that met in Mesquite, Nevada at 9 a.m. Perfect--except I forgot that Mesquite is in Pacific time, not Mountain. When my navigation app told me I would arrive an hour earlier than I expected to, I figured it out. Another quick search on Meetinghouse Locator found a congregation that meets at 8 a.m. I felt sorry for that ward, especially on the Sunday that we turned the clocks forward, but it fit perfectly into my schedule. Photo: My oldest grandson gently carries his chicken under his arm. 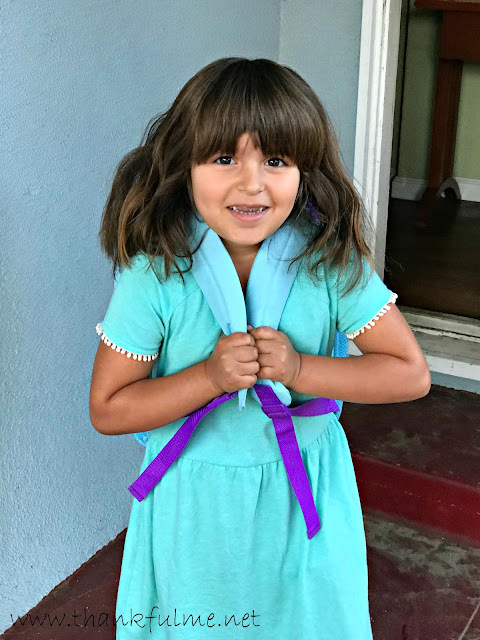 Photo: My oldest granddaughter holds onto her backpack straps and smiles for the camera just before we walk together to school. 6. I'm thankful for new phrases learned. I had always thought one of my granddaughters had curly hair, but I was told during this trip that her hair is "wobbly." "Wobbly hair" has now joined our family lexicon, earning its place next to words like "hamdinger" (hamburger) and "same-ole-time-eously" (simultaneously). Photo: My "wobbly-haired" granddaughter (in profile) gazes off to the distance. 7. I'm thankful for lessons learned from innocent comments made. "This is Not My Appointment" became the inspiration for a blog post--one of the few, besides Ten Things of Thankful posts, that I have written in a while. 8. I'm thankful for an uneventful drive home from Utah. I didn't start driving until after 6 p.m., and I wanted to make it to Mesquite before stopping for the night. I am not a night owl, and I was afraid I would be sleepy, but I made it--with .03 gallons of gas to spare, too! The combination of M&M's, Chad Mitchell Trio CDs, and blessings for a week of service really paid off, and I was not sleepy at all, even though the sun was down and it was well past my bedtime when I arrived at the hotel. 9. I'm thankful that while I was away, work continued on the house. The painter finished up his job. This coming week, the carpet will be replaced, and we can start actually moving our things in! Photo: A before and after collage of the stairs leading from the family room to the main level of the house. 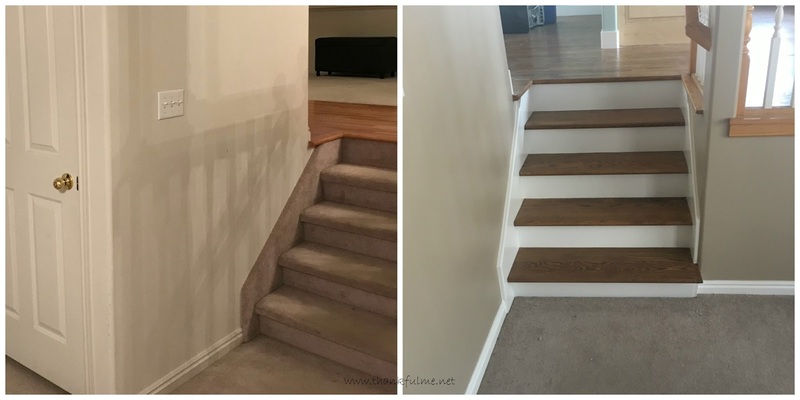 On the left, the steps are carpeted. On the right, they have been replaced with hardwood, and the risers and skirts are painted white. How are you adapting to the time change? What things are you thankful for this week? Josie does a great job hosting this blog hop each week; feel free to join us by commenting and/or linking your own post below! Frist. You have adorable grandchildren. I was getting confused with the time zone thing, I can imagine how crazy it is to switch time zones and set clocks ahead in the same night. I'm so excited for the progress on your new home. I look forward to "taking the tour" when it's complete. I was very confused with the time change, but on the bright side, I traveled the correct direction, and didn't have to adapt to the change until I returned home. "...same-ole-time-eously" what an excellent word. (Pass on my compliments to the originator, it has that perfect balance of nonsense and 'why that's exactly what I thought you meant'). Moving in will surely be a time of satisfaction with the efforts that (we've all watched) you and John put into this not-as-easy-as-photos-make-it-look project. Wonderful thankfuls. Your grandkids are all so adorable, you are truly blessed. You crossed the finish line. That is the most important thing! 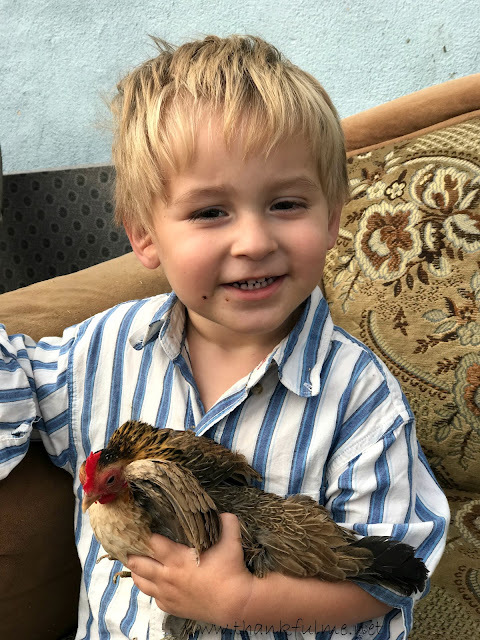 Your grandson is carrying "his" chicken. That makes me smile! It sounds as if it was a difficult decision not to take your former pupil into your home but often it is those difficult decisions that turn out to be the best for all involved. We are looking forward to settling into the house. I had to get a photo of the chicken-carrying toddler! It made me smile, too. Yes, it was hard to say no to Willow, but I know it is for the best. I just love those photos of the kids! Repetitive story reading and telling that never gets old for the kids but may wear out the story teller. . .I remember those years. Good memories.